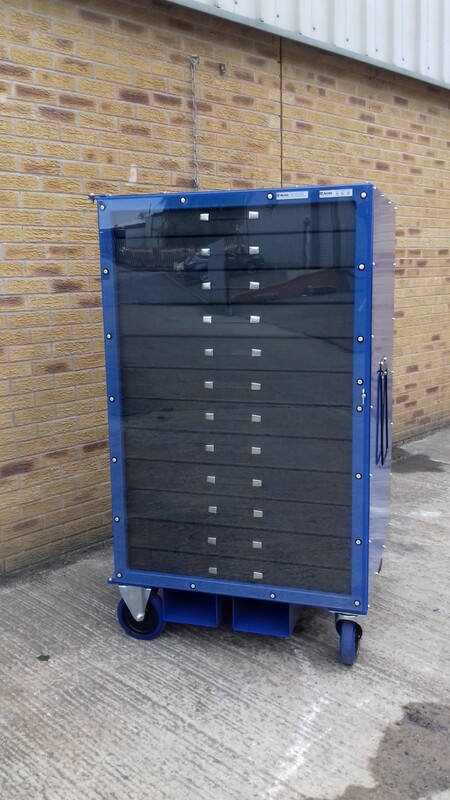 The BP49 Wardrobe has been designed and manufactured for a Midlands based aerospace company to fit un packaged items from the BP49 engine kit. This solution was required to maximise the use of space and reduce the overall footprint of the unit. The main framework has been manufactured from 25 x 25 box section with a thin wall to provide an optimum strength vs weight solution. The unit also has 25 x 25 angle for the drawers to sit on. On the base of the framework there is fork lift pockets for easier lifting. The unit features a hinged door which allows the door to fold all the way back when opened. The door is made from 50 x 25 rectangular section, with a sheet of clear plastic riveted to the front of it to allow the operator to see in to the unit. The unit features 12 plastic drawers to protect parts from any metal to metal contact. The wardrobe features drop down handles and door handles which will be the same as the A Frame design in order to maintain standardisation. The wardrobe features 4 off 200mm castors, 2 fixed and 2 swivel with brake. The unit has been powder coated in Blue BS 20 D 45 to provide a hard wearing, long lasting finish.